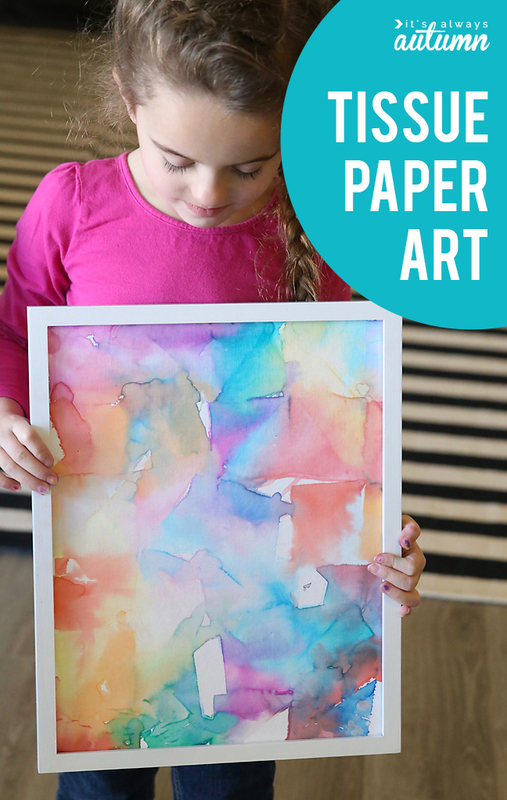 In today’s post: Learn how kids can make gorgeous “modern” art with this fun tissue paper art technique. My younger kids and I have had so much fun today with a new art project: easy tissue paper art. 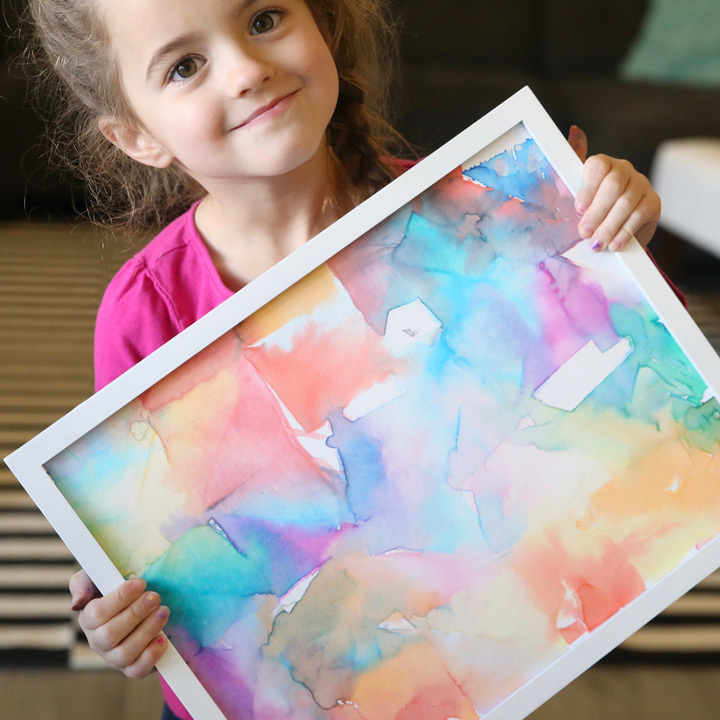 It’s a really simple process that even my 5-year-old could do all on her own, but you end up with a final product that looks like a beautiful art piece! Doesn’t this look like something you could buy to decorate your home with? It’s so easy that my five year old daughter was able to do the entire process all by herself! Cool, right? 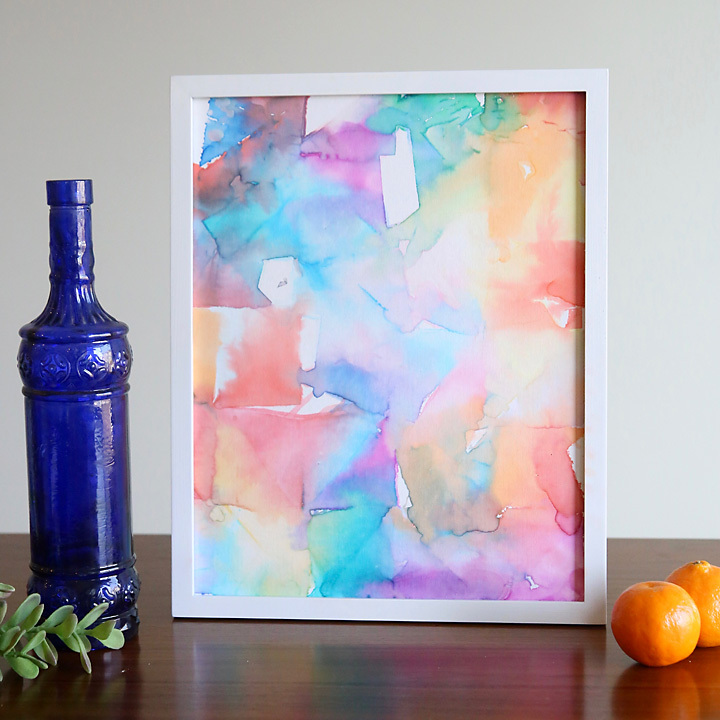 All you need to make tissue transfer art is tissue paper, a canvas, and a spray bottle. I first tried this project with tissue paper from the dollar store and it didn’t work AT ALL. So I turned to Amazon and found this Bleeding Art Tissue (affiliate link). It bleeds through onto the canvas beautifully! We made three 11×14 canvases and have TONS of tissue paper left, so it will last us through lots of projects. I found the flat canvas panels at Walmart for $5 for three 11×14 panels which I thought was really reasonable. The flat panels are nice because you can pop them into an inexpensive frame if you want. You can find canvas panels on Amazon – get twelve 8×10 panels for $13 here. If you want to do tissue paper art over and over (and we will! ), you can also use watercolor paper. 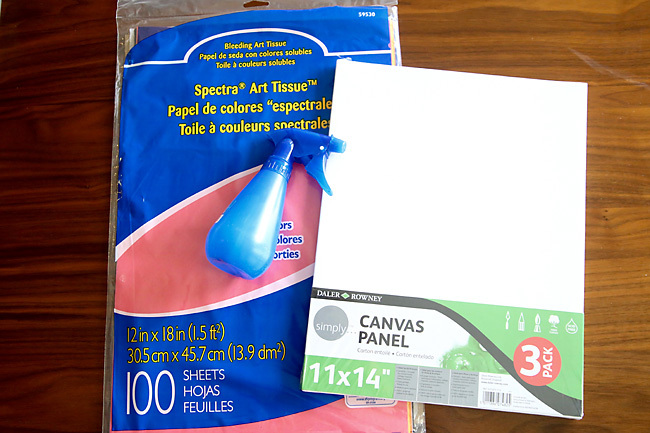 The process for tissue paper art is simple: use the spray bottle to get the canvas fairly wet. Cut tissue paper into desired shapes (we used triangles) and place them on the canvas. You can put them in a single layer or overlap them for more color mix. Spray a little more water on top of the tissue paper, then wait 20 minutes. Remove the wet tissue paper and let the canvas dry completely. 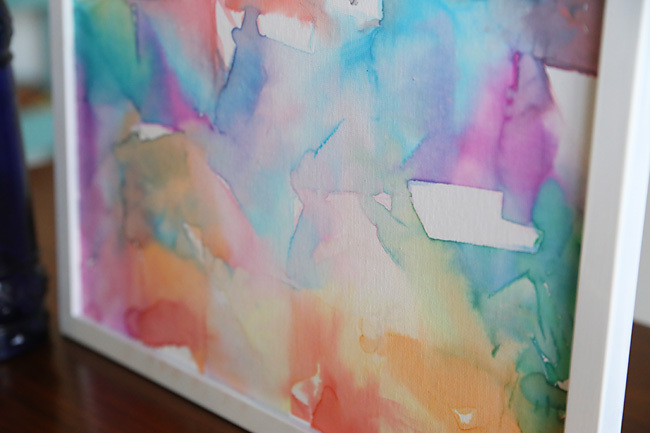 The colors will bleed from the tissue paper onto the canvas, creating a pretty watercolor effect. We found that the colors continue to blend and seep into the canvas for a little while after the tissue paper is removed, so the final project looks even cooler when it’s completely dry. I love the texture of the canvas panel – it really makes this look like a work of art! My daughter is thrilled with her artwork. We didn’t use the 2 or 3 darkest colors in the tissue paper pack because I found they bled too much and overtook other colors, and we didn’t use the 2 lightest colors because they didn’t transfer very well. The color will bleed onto anything the wet tissue paper touches, so be sure to protect your work surface and realize you’ll end up with colored fingertips for a day or so. What a great idea. I wonder how it would work if you used the fabric treated to go through a printer. This is so pretty! I would love to do this with my kids as decor for our new home!! Thanks for the idea! What a great idea, I think I will do it with my 5 four year olds on grandma day. Please tell your daughter that I think her work is beautiful. Awesome idea thanks for sharing. I LOVE this. I work in a memory care community and I think my residents could do this. I am getting the supplies this week. Thank you for sharing. Thanks for sharing this wonderful project! Your daughter art is just gorgeous, and so is she! Thanks for the warning that using cheap tissue paper isn’t a good idea; I definitely would have tried Dollar Store stuff! I’m curious about watercolor paper that you mentioned. How do you use it? Again, thanks for sharing! Did this project with my 2nd graders. We used orange, yellow, green and reds and white construction paper. Then they cut out the colored paper into pumpkin shapes. They turned out super cute. Or you can draw the pumpkin outline on the paper first and then add colored tissue paper. Bleeding tissue seems to be something that Australia hasn’t yet embraced….but I LOVE this idea, thinking I might have a play with some crepe paper and see if that works. Crepe paper works well if you spray/paint with some vinegar mixed in the water! We did this this afternoon and my girls all loved it. We have stained hands and fingers — a sign of a fun project! Thanks for the idea! I found it works with regular tissue paper if you use spray rubbing alcohol. The fumes could be rough though so be sure to do it in a well ventilated area. Wendy, Did the rubbing alcohol hurt the canvas at all? Going to try this with my Grandkids. ages 4, 6, and 8. they will create a “masterpiece” for their mom’s office for Mother’s Day. I just ordered the tissue from Amazon, couldn’t find any store that carried it in stock. Thanks for the idea. I am a preschool teacher and we will be creating this project for our mothers for Mother’s Day. Needing to find the bleeding tissue paper quickly and on a preschool teacher’s salary, I searched the web and found our local craft chain (Michaels) said they carried it. Upon visiting the store, they in fact did not carry Bleeding Art. However, a helpful sales accociate checked the item number for that brand and the exact number came up under another name…”Celebrate It”. I bought it and it works. Have your readers request help in their local stores to check the item number. May save shipping costs. Thinking of using this as a vbs project with our three year olds in childcare. Thanks for the tip about the Michaels brand working – their coupons are great too! Walmart carries it in stock. Okay, you guys! This is for all the adults out there who can only draw “stick people,” just like me. This article should be named for kids and adults who draw stick people! LOL! LOL! Really, I am so serious. Going to pin this and label it, wall art. This project is so simple but the outcome is awesome. You can pick your own colors and make the art work any size your heart desires. What a good idea and how fun! This is so neat even small children could do this. I’m planning this for one of the crafts we will do on vacation with my grandkids! Great post, what you said is really helpful to me. Do you have to use the “bleed” tissue paper? Love it. Looks like my 3 yr old Grandson and I will do this. What a fantastic craft for kids! I love this idea. I am going to try this with my daughter’s 3rd grade class as a Valentine’s gift but I am going to incorporate a heart outline…I think this is a beautiful project. Read that Celebrate It tissue would work. Not as dark as I thought. I thought I read alcohol will make the tissue bleed more. Help. Doing project Friday. So beautiful! What a great idea. Thank you so much for sharing! I will try it myself as soon as I get the tissue paper you recommend. I cannot wait! Thanks so much for this tutorial! I bought the supplies a month ago, hadn’t done them yet, and then it was Easter – so we did Easter eggs this way (dip egg in vinegar, apply dry tissue scraps, let sit for 15 mins or so.) Worked beautifully! https://www.flickr.com/photos/weavingmajor/33880572222 I can’t wait to try it on watercolor paper! How do I send notifications to my email? Thank you for sharing your experience. I bought some of the tissue paper you’re talking about, and I am glad to know about the darkest and lightest colors. I have a couple of HUGE canvasas, like 2×3 ft, maybe, that were given to me and I wasn’t sure what to do with them. I was too intimidated to try to do a painting, but I think this will turn out beautifully. I’ve made these with my 3 kids too! I bought 5X7 canvas panels and had each child create their own. I framed them with simple white frames and hung them in my bathroom. I love how they turned out. I love children’s art. I only hang art in our house that we created or has a special meaning to us. It’s so much more special. Love your blog! Wonderful idea! Can’t wait to try it with my grandkids ! Nice creativity we have seen in your post. The way you have described your stuff is pretty cool. I like it. wow!such a clever idea. This fun art project develops kids creativity and helps kids mantel growth. Thanks for sharing really nice and amazing thought. great idea for children health . It’s a great project. Do u think it’s possible that it’s done on paper or any thing els instead of canvas? I’ll be trying this out soon with my students but we only have an hour for our workshops. Do you think I could dry the work with a blow dryer to speed up the process? Looking do to this for our daughter’s birthday. What frame did you use? I need your help. I ordered the canvases from the affiliate link on Amazon from your blog and I got the bleeding tissue paper. I did everything exactly like it said but the color did not bleed into the canvas very well at all. it seemed like the surface of the canvas was not very porous and the water and color did not soak in very well. what do you recommend? Should I order different canvases?